HT: Does the acceptance for publication get easier after you’ve been published or does that stay the same? 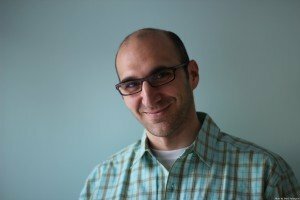 AB: Oh, if a publisher is happy with what you’re doing … I didn’t even think about doing a second book to be honest, I was just so excited that I got to do a book … I wasn’t working for Lucas Film … and at some point I was talking to my agent about something to do with Journey’s publication. We started talking about, “Oh, should I do another book?” So, it wasn’t difficult. We had a meeting with Candlewick, and they’re like, “Sure, let’s do it.” So, it wasn’t like a laborious project to get that second contract, but it took a while because it simply didn’t occur to me that I could do another book or that it was even in the cards. 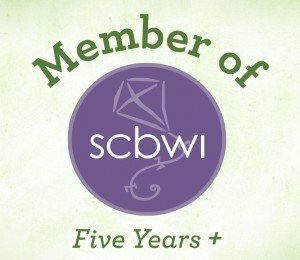 HT: I’m so excited that there are going to be more books! Can you tell us anything about the new books, or am I asking too much? AB: (Laughs) I can tell you a little bit about it. HT: Do you feel that you know this character really well? Is she you do you think? AB: Yeah, she’s definitely me. The story become pretty autobiographical by the end of the third book. The second story is very much an adventure story, but then in the third story it gets a bit more personal, and goes back to her relationship with her family. It gets touched on at the beginning of the story, and she goes off to Narnia, and leaves it behind so I wanted … to somehow come back home, and resolve things with her family because it really doesn’t get resolved that they aren’t meeting her in play … I wanted that chance to do that. So, that’s what’s going on in the third book now. HT: That’s great to know because that was actually one of my questions. The family at the beginning of the book, I noticed, are all involved with some sort of electronic gadgetry. Mom’s on the phone, but she’s cooking. Dad’s on the computer. Maybe the girl in the pictures’s an older sister? That’s how I read it anyway. She seems to be on some sort of gaming device, or iPod, or something like that. Do you feel that technology has encroached upon our family time? AB: Well, for sure it’s such a common experience now. I don’t think there’s anyone who’s not going through that personally or with their family. I think it’s even a stand in for all the things that get in the way between a child and their parent … it’s just a kind of a handy visual cue to show that they’re occupied. I use computers, but … I feel ambivalent about them. On one hand I see their use, on the other hand I see that they get in the way of our personal relations. HT: I was just going to tell you that when I passed this book around to my family, my mother, who is a writer, saw a whole creative process going on, the creative journey. Sometimes, she said, you need to pull away from people to be creative, and then come back to being collaborative as the heroine does in Journey. It seemed to her like you were saying that the only way to make the creative journey is to make the journey on your own, just creating, and only then can you enter into a collaborative process with somebody else. AB: That’s great. I love that you just put it out there, people are going to see what they want to see, and it works for them. The story is loose enough, and it has to be the exact right amount of looseness and tightness. If it’s too loose you can’t follow the story, and if it’s too tight, it doesn’t get to be your own. 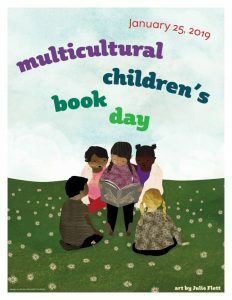 HT: Do you have any favorite stories about children or adults who read the book in a particular way? AB: When I asked kids what journey means, I get the best responses. They are often something like, “A journey is when you’re going somewhere and you don’t know where you’re going to end up.” So much more profound than what I was thinking! So, to the extent that the title of the book could be interpreted differently or can have different meaning to different people, every picture does as well. HT: Do you feel that there were any books that you read as a child, or in particular any wordless picture books, that have influenced you as an artist? AB: Well, on the wordless front, I always really liked Chris Van Allsburg’s stuff, and he didn’t do strictly wordless books, but his pictures had that feel to them, sort of stories within the stories … The Mysteries of Harris Burdick which has words, but it does sort of only hint at the story. No, I think for me I don’t know where the wordless thing came from, except for the fact that I think so visually. It was much easier for me to write the story just by sketching it out. HT: In Journey the illustration of the castle is so beautiful, so gorgeous, and just so intricately detailed. I’ve read that you drew inspiration from a castle in France and from David Macaulay’s Castle. HT: It’s interesting, one of the people I had look at the book said that what they saw there was a “World Castle.” I asked, “Could you explain that a little further?” and this particular person said, “I see architectural influences from all over Western Europe in the castle.” Is that true? AB: Oh, yeah, yeah, yeah. You have to imagine all these different cultures. It’s an old castle that built up over many years, and they traded with lots of people. It’s right on the ocean, they traded with lots of different cultures, so that has sort of seeped into it. There’s a little bit of Asian influence, Moroccan, and African influence. HT: That’s great. That page stays with me visually just because it was so impressive. I imagine, and this is just me guessing, and you correct me if I’m wrong, but was that the most time consuming part of making the book? AB: Oh, that castle drawing? Gosh, was it the most time consuming? It probably was. It’s a pretty detailed drawing. I would have to say … yes (laughs). Technically, from a watercolor standpoint, the hardest painting was the forest because of the need to get the different layers of leaves in there just right along with the right amount of darkness and light. Strangely enough, when I got the scenes with the “sky scapes” that was hard for me to do, to paint clouds. I had never done watercolor before I did this book, I had to teach myself watercolor … I knew if I wanted to do a children’s book, I wanted to do it in watercolor. So, when I finally got to the sky, I thought okay, I’m out of my league here. I’ve got to practice this some more before I move forward. HT: I didn’t know you had taught yourself watercolor. That’s a very difficult medium, I’ve heard, to get everything just right. AB: It’s hard. It’s unforgiving. Once you put a pigment down you can’t lighten it. You know what I mean? So, if you put down a light blue and it goes a little bit too dark, you can’t remove that darkness. It’s stuck in the paper. HT: What was your favorite part of creating Journey? HT: I would imagine that there were pretty big celebrations at various points of this journey, of getting it published. I was just wondering, was there one, big celebratory moment when everyone in your family was just so happy? AB: Yeah, my wife and I were at a hotel in New York City for some event related to the book. I think I was just going to a bookstore and I was doing some bookstore signings. We’re at the hotel and I got an e-mail. I was already pretty excited just to be traveling and promoting the book, and then an e-mail came in from the art editor at the New York Times Magazine. He … was asking me if I would be interested in doing a … cover for their children’s book issue. And that was it. That was the pinnacle of my career. I couldn’t imagine things getting any better. So, we went out and celebrated that night for sure. 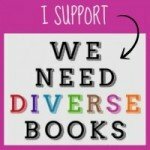 HT: What do you hope that children will take away from reading Journey? On behalf of our readers all of us here at GRWR we want to extend our thanks to Aaron for his candid interview, and very pleasant nature! Thanks Aaron! Also, a big thanks goes out to the Candlewick publishing team who worked with us to provide the captivating illustrations you see from Aaron’s book throughout the interview. Happy reading! Wonderful interview Hilary. I really enjoyed learning more about this talented artist, and I predict many more incredible books from him in the future! 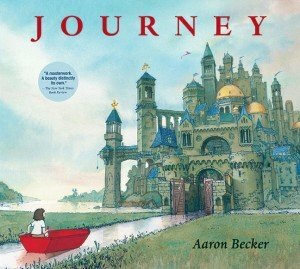 Did you know that todayJOURNEY by Aaron Becker was named a Caldecott Honor Book? Thank you so much, Cathy! We can look forward to two more books that are definitely in the works. Aaron justly deserves his Caldecott. I was so happy to hear his good news this morning! Thanks for commenting. It means so much to me. I think I just slipped up there because I wanted so much for him to win the big, golden Caldecott! Let me rephrase that. Aaron justly deserves his Caldecott Honor, although in my books he’s got that Caldecott! We all have our lists of favorites, and this book definitely topped mine. However, Locomotive was an excellent book. Just so many to choose from! I don’t know how the Caldecott committee ever makes the final choice. So many great books this year! I agree with you, Hilary. I don’t know how any of those committees can make their final selections. I certainly admire all the participants for committing to such an important job. The kids are the winners, really! !